Pacific Metal Stampings provides high quality 301 stainless steel stamped components for the automotive, aerospace, hardware and food processing industries. 301 stainless steel has a moderately high tensile strength and excellent corrosion resistance. Our products are also available in hard, half hard, and full hard 301 stainless steel. 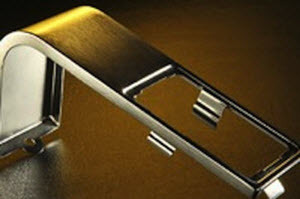 Pacific Metal Stampings provides low-cost, high-value tooling for any project quantity. 301 stainless steel stamped parts are most commonly used in metal forming because of its high work hardening rate and versatility of the grade. An industry leader, Pacific Metal Stampings is a LEAN manufacturing award winner and ISO 9001 certified company. Streamlining your project from start to finish, our team of metal and alloy specialists works within your budget and timeline parameters to achieve your project objectives.